Home Catch Reports Fishing at New Bungsamran Lake near Bangkok. After a highly productive day snakehead fishing at Pilot ponds, Hamza continued his fishing holiday with a visit to the New Bungsamran Lake located just outside Bangkok. A short forty minute journey saw the angler soon arriving at the lake to the sight of hundreds of catfish topping out in the centre of the lake. It wasnt long before the angler was casting a large ball of lam out towards the showing fish in the middle of the lake. After rebaiting and re-casting a few more times, line began to exit the spool of the reel at an alarming rate of knots! Lifting the rod into the unseen Mekong Catfish saw it bent into full fighting curve as battle commenced and the fish powered off across the lake. With the newly opened New Bungsamran lake being stocked with all of the monster fish that previously resided in the old Bungsamran Lake in addition to a new stocking of monster sized Mekong Catfish and Giant Siasmese Carp anything could have picked up the bait! The fish stayed deep and continued to strip line from the spool as it headed for the far bank. Continued pressure applied with the clutch and a rhythmic pumping action with the rod soon saw the fish slowing down, before embarking on another powerful run. A ten minute battle followed which saw the Mekong Catfish continuing to battle all the way to the net. On netting the Mekong Catfish it was hauled up onto the platform to reveal a muscular 30 kg specimen. The fish was released and swam away strongly and fishing commenced once again. Hamza caught steadily throughout the day landing a further six Mekong Catfish, fishing with only one rod. The hard fighting haul of Mekong Catfish ranged in weight from 20-35kg and every one fought every inch of the way to the net. 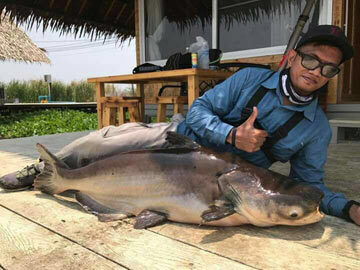 Although by Bungsamran Lake standards no really big fish were landed, Hamza enjoyed a hectic days angling landing seven hard fighting Mekong Catfish.